Kill the Debbie Downers coutresy photo. The opening sequences of Kill the Debbie Downers! announce that this adaptation of Chekhov’s The Three Sisters will not be a traditional rendering – that is, if the title of this version isn’t clue enough. Unconnected to the source material, three adult women’s sisterhood is symbolized as they slither and dance around their respective chairs in unison. But while we first observe their commonality, we soon see the sisters’ differences. Co-Directors Mark Jackson and Beth Wilmurt retain the framework of Chekhov’s original text but condense the action and eliminate all but six characters, yielding a taut story line but with limited plot or character development. To enhance interest and brighten the tone, the arrangers add incidental music, songs, and extraneous diversions that work despite themselves. Aided by top-notch staging elements, the result provokes and entertains, though its full meaning may not be grasped without background knowledge (if ever). For the uninitiated, the “Debbie Downer” notion was popularized on Saturday Night Live by cast member Rachel Dratch starting in 2004. It refers to those gloomy people who seem intent on raining on everyone’s parade. The apt connection here is that each sister is dissatisfied and depressed in some way, and these conditions tend to bring down people around them. Indeed, a common thread among all six characters is dissatisfaction with their love lives. Those who are married are unhappy with their spouses and having affairs; those who are single wish they were married and are unable to find love; and those who propose marriage are rejected. Of notable birth stock and raised in Moscow, Olga, Masha, and Irina are adult sisters who find themselves stuck in a provincial town with little stimulation and no townspeople that they consider worthy. They yearn to return to Moscow, but have settled into insignificant existence, left largely with their memories, which become distorted with the passage of time. Although they must work to meet financial necessities, in many ways, they reflect the attitudes of the gentry, oblivious of the simmering resentment that lies beneath. The 800 pound gorilla in this scenario is the looming Russian Revolution of 1905. And symbolic of that upheaval, sister-in-law Natasha becomes an unwanted addition to the household. From a lower class than the sisters, she is initially unconfident and deferential in her relationship with them, but mirroring the coming change in greater society, that relationship evolves. Amplifying the thematic elements of the play and giving it a modern sensibility and relevance to the current political environment, lengthy video projections augment the live action and gain the audience’s undivided attention with their currency and gravity. They also suggest the prospective collapse of society if ignorance and apathy are allowed to reign. Another device is totally irrelevant to the narrative but charms and amuses – a set piece concerning the usual pre-show talk at theaters about public safety. I know it’s hard to imagine how that would be funny, but take my word for it. Another curiosity is the party celebrating Irina’s birthday, which includes an eclectic mix of songs. Though some carry cogent messages and others represent cultural characteristics, more than anything, they add to the absurdist tilt of the proceedings. The cast is wonderful. It would be unfair to single out individuals, as they each merit mention. They are Sam Jackson as Olga, Erin Mei-Ling Stuart as Masha, Gabby Battista as Irina, Amanda Farbstein as Natasha, Billy Raphael as Doctor Chebutyken, and Nathaniel Andalis as the soldier Solyony. Mikiko Uesugi’s set and Sara Witsch’s sound design are highly effective, and a special recognition goes to Ray Oppenheimer for his detailed and magical lighting. It goes without saying that all of these stellar contributions are orchestrated by Jackson and Wilmurt. Kill the Debbie Downers! Kill Them! Kill Them! 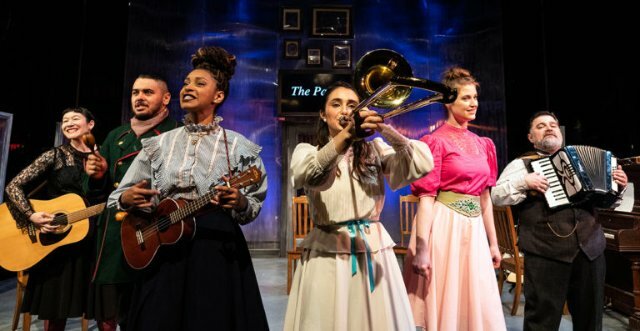 Kill Them Off!, treatment by Mark Jackson and Beth Wilmurt based on The Three Sisters by Anton Chekhov, is produced by Shotgun Players with performances , 1901 Ashby Ave., Berkeley, CA through April 21, 2019.